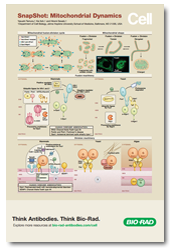 We have collaborated with Cell Press to provide a range of cancer research related posters that cover aspects of both clinical and basic cancer research. Acute Myeloid Leukemia (AML) is a rare type of cancer in which abnormal white blood cells, also known as blasts, grow in an uncontrolled manner. Blasts accumulate in the bone marrow, resulting in defects in blood cell production. Several AML subtypes have been identified, and the World Health Organization classes AML patients according to their cytogenetic features into three risk groups (favorable risk, intermediate risk and adverse risk). In addition to prognosis, treatment options also differ according to the different AML subtypes. 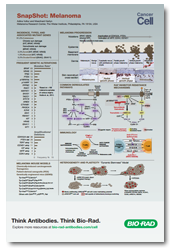 The “SnapShot: Acute Myeloid Leukemia” poster provides an overview of AML risk stratifications, frequency and types of genetic alterations, as well as current therapies. In addition, the “Cell of Origin and Clonal Evolution Model of Leukemic Stem Cells (LSC)” is discussed, highlighting the importance of the LSC origin for determining the leukemia lineage and type. Melanomas are considered to be one of the most aggressive and difficult to treat types of cancer. However, recent breakthrough discoveries of frequent mutations have enabled novel and more efficient treatment possibilities. The BRAF kinase is mutated in ~60% of all melanomas and mutation of BRAF valine residue 600 to glutamic acid, BRAF (V600E), is by far the most common, accounting for 90% of all BRAF mutations (Hodis et al. 2012). The effect of this mutation is a constitutively active BRAF kinase that activates MAPK/Erk kinase signaling pathways and results in evasion of both apoptosis and immune responses. The “SnapShot: Melanoma” poster covers the most common genetic mutations resulting in the development of melanomas, highlights the progression from an aberrant melanocyte to a metastatic melanoma and covers treatment approaches using both immunotherapy and kinase inhibitors (vemurafenib, dabrafenib and trametinib). The tubular shape of mitochondria is highly dynamic and regulated by fusion and division (fission) processes. Imbalance or misregulation of these processes affects cellular health and has been shown to play a role in the development of neurodegenerative disorders such as Parkinson’s disease, autosomal dominant optic atrophy type 1 and neuropathies including Charcot-Marie-Tooth. 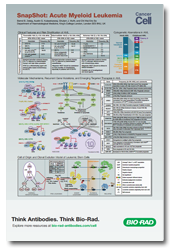 The “SnapShot: Mitochondrial Dynamics” poster provides an overview of the mitochondrial fusion-division cycle and the fusion machinery in mammalian cells and yeasts as well as the division machinery in mammalian cells, yeast and algae. Hodis E et al. (2012). A landscape of driver mutations in melanoma. Cell 150, 251–263.